A book review blog dedicated to giving honest reviews on YA books. This book was way different from Divergent, but not in the good way. I was a fan of Roth's other series and I even remember enjoying Allegiant during some parts (definitely not as much as the other two books), but I just couldn't get into this one. When I picked this book up I had no idea that it was controversial. I hadn't read any reviews or really looked up the book at all, I just saw that Veronica Roth had written it and thought that I would give it a try. I am not claiming to be an expert of racism, but I don't really see why this book is so controversial. Yes, there are two groups of people of different races that are at odds, but it makes sense for the people from Thuvhe to be lighter skinned because of the climate they live in. People in colder climes tend to have much lighter skin because their skin needs to be able to absorb more vitamin D due to the fact that the sun isn't as strong (please don't quote me on this, I'm just trying to remember what I learned from classes I've taken). The Shotet live in a much milder climate, so it makes sense from them to have darker skin. Am I an expert? God no, but I'm struggling to understand why this book is so controversial. Anyway, moving on from that. This book was not at all what I expected. 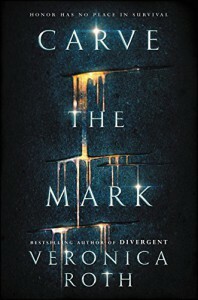 Divergent was a faced paced thrilling story, while Carve the Mark seemed to drag on forever. The first chapter was extremely difficult to get into. So many names are thrown around. There's a lot of confusion and it felt kind of like a mess and I was so close to just stopping there because it was that unappealing. It was too much all at once, but at the same time it seemed to move at a snail's pace. While the rest of the book definitely improved from the first chapter, the pacing did not and honestly my overall confusion wasn't really cleared up.Time seemed to fly by in a matter of pages, but it didn't feel like it and it was sometimes hard to remember that however many years had passed. I think at one point during the book it was mentioned that Akos was fifteen when he started training with Cyra, but like I'm pretty sure he was older than that when it was mentioned and I didn't realize that Akos and Cyra had known each other for years now. It was really odd and confusing. The characters weren't bad, but they also didn't stand out. Cyra was alright, but I dreaded reading Akos's chapters. They were so boring and honestly I didn't really care much about Akos in the first place so I didn't really want to read about his POV. I did think that Cyra's currentgift was the most interesting part of the entire book. I definitely liked the idea behind currentgifts and the current, but I kind of wanted a little more explanation. Also I saw the romance between Akos and Cyra coming from a mile away. I wasn't really insta love, but it also didn't feel believable. When they first kissed it kind of felt like it came out of nowhere. And now for the plot. For maybe a little less than half of the book, I kept asking myself "where is the plot?" It was basically nonexistent for a large chunk of the book and this left me feeling like there was no direction to the story for awhile. Once the plot did get going though I did enjoy it, but it wasn't really original. Overall, I'm really disappointed by this book. I was a fan of Roth's other series so I was expecting a lot more from this book, but it didn't deliver. I probably won't be picking up the next book, unless it gets really good reviews.